When apps for mobile devices were first introduced by the launch of the iPhone, they were written natively for the platform. As time went, more platforms entered the arena namely Android and Windows Phone. All three platforms has a fair user base. When a company or organization wants to create an app they are faced with the choice “what platforms do you want to target? What platform is used by your customers?” Often the answer to that question is that the users are spread among the three platforms and the company wants to target as many of their customers as possible. As always there are (most often) restrictions to the projects and the biggest restriction is budget. It can be very expensive to target all the platforms with native code, especially if you build big apps like mobile web shops. Decisions must be made in how to proceed. One option is to forget about the apps and go web. That can be a good decision sometimes but not always, for instance many companies’ wants to be published and exposed via the different app stores or when the phone characteristics is needed (GPS etc.). Fortunately there is another way – Hybrid apps. 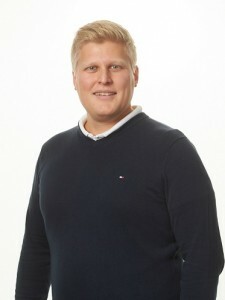 The app is native but the content is built with HTML and CSS. The content is the same for the different platforms but it is hosted in a native app shell – one for each platform. 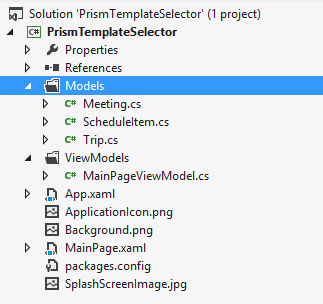 First of all, launch your Visual Studio and then go File->new project. 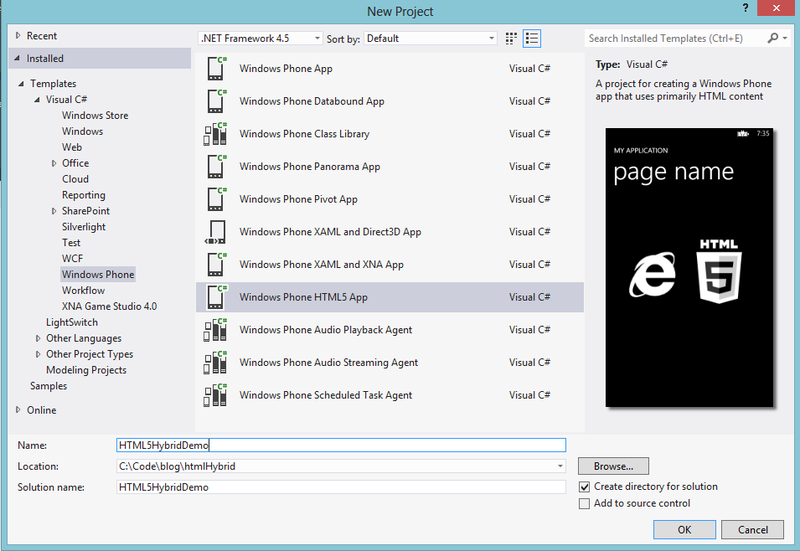 In the project dialog, choose the Windows Phone HTML5 App. The project template that is created is basically an app containing a Web Browser control (IE) with navigational buttons; forward and back. Take a look at the project structure. 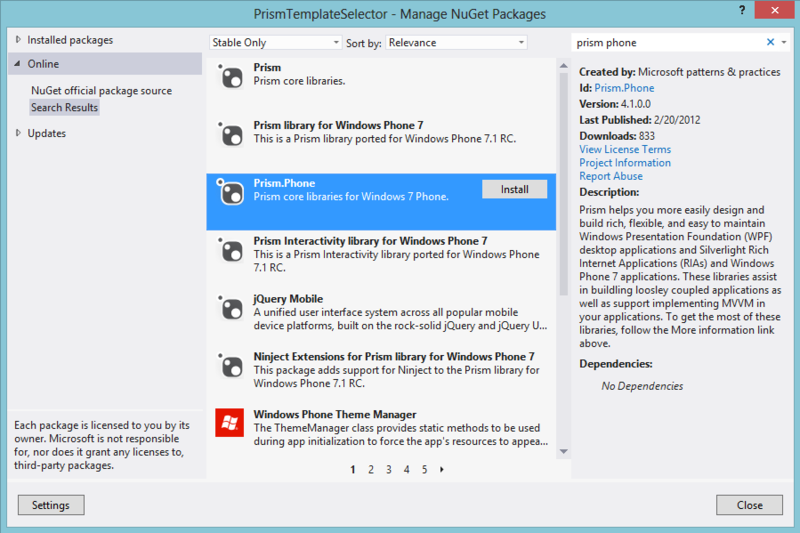 You will notice that you got one more folder than when you are creating other types of Windows Phone apps, namely the folder called Html. This is where we will put our content. So far so good. We have a running app that uses an html file. We can now add as many html files as we want to create our content. Our html files work just like they would on the web, with link navigation etc. Well this will not suffice in most cases, we want to use the cool features in the phone! So our next mission is to get connectivity from the phone to the web page and back! 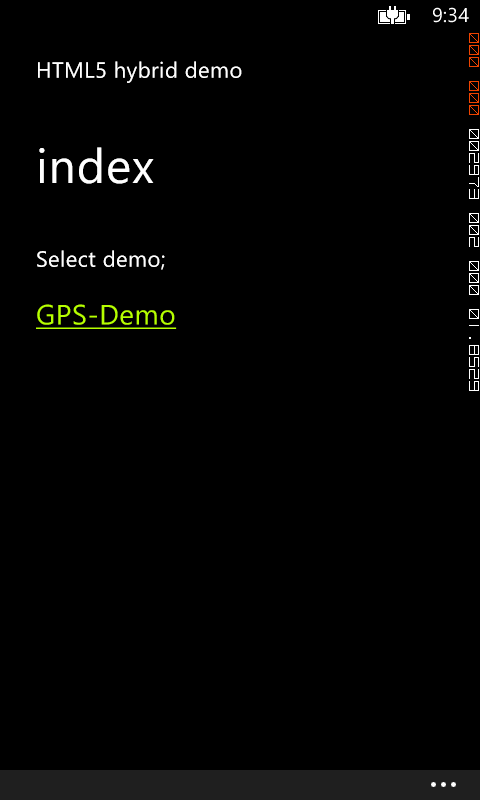 The first demo we are going to implement is a GPS-tracking web page. We will use the GPS-chip in the phone and let the web page decide when the tracking is on or off. 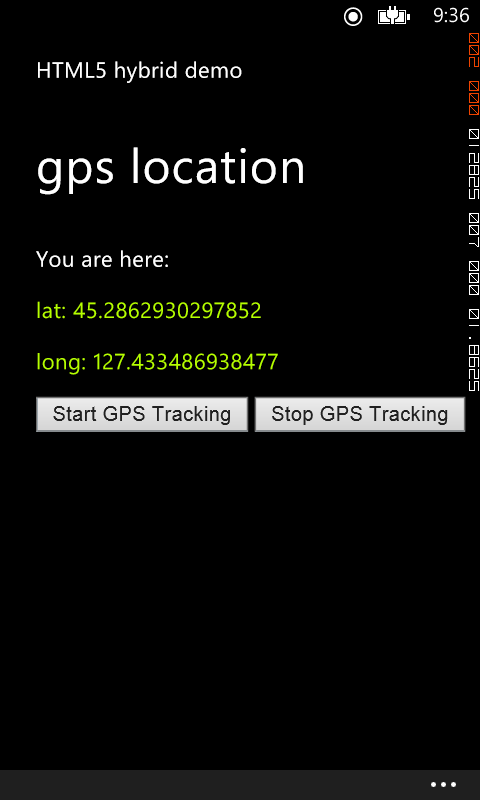 When the tracking is on, the phone will send GPS-data to the web page that will be displayed. First step is to create the web page for our demo. 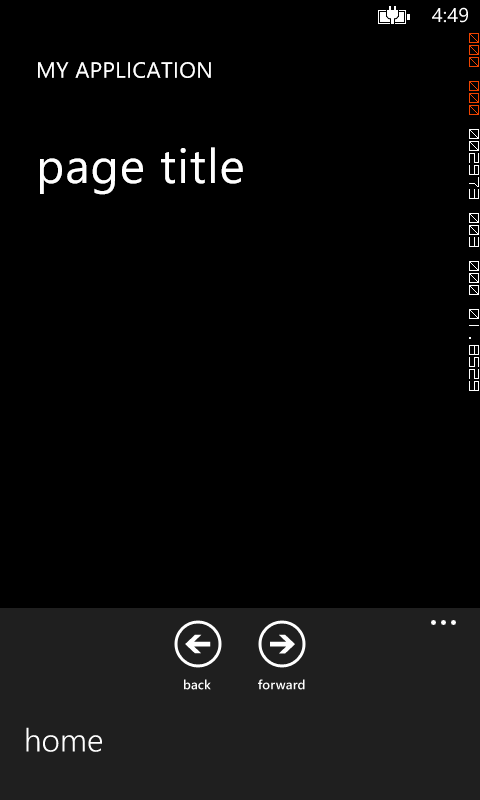 We call the page gpspage.html and we place it in our html folder. Then we add some basic html to our page. We add a few rows to our css file just to emphasize on the lat, long part and when we are at it, we add css for links for our index file as well. So now we have the interface. There are a few things left to do before we have a runnable demo. First of all, since we wants to use the GPS, we need to add that capability in the manifest file. Then we will need to write some native code for the GPS to work. This is done in the MainPage.cs file. First we add a field for our GeoCoordinateWatcher and then we initialize it in the constructor of the page. Next we need to implement the start and stop. First we navigate to our method for handling notifies from the web pages and add a switch for where we are. This is to keep our code nice and tidy. And then we add a handling method for the GPS page. 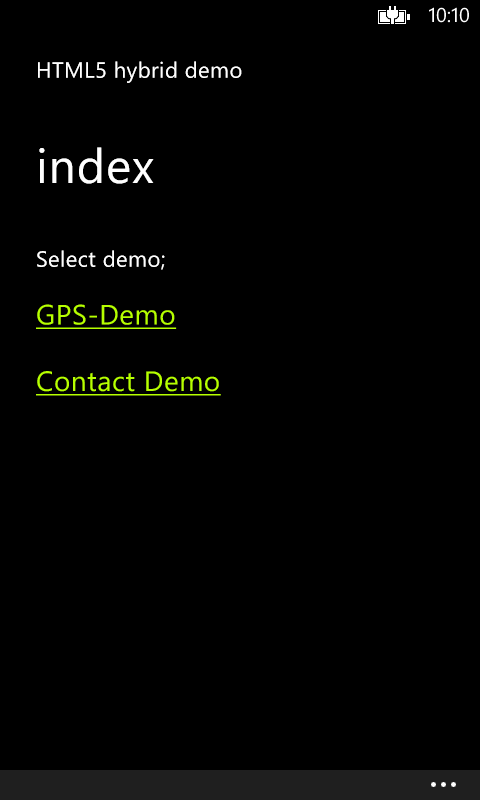 Final step before we run our app is to add a link to our index file so we can navigate to our GPS tracking page. Finally we need to add a new link in our index file. 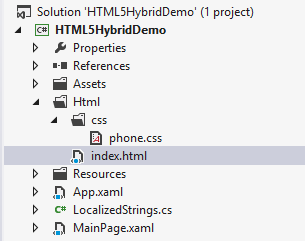 So now we have created a hybrid app with two nice features that uses the native shell. The only thing is that the navigation is a bit odd. If the user tries to navigate back using the hardware button after selecting a new web page, the app will close. This is because the navigation is done in the browser and not in the app itself. This can create frustration among the users since they expect the app to navigate back. 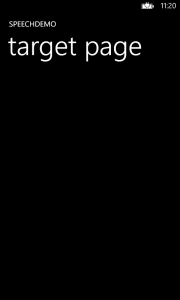 To add a feeling of being more native, you can override the default back behavior for the button. To do this, add the following method in the code behind. What we do in the code above is to see if the browser has back entries. If it does and therefore can go back, we navigate in the browser. If not, meaning we are back at the index file or we never navigated away, we will adapt the default approach and exit the app. By doing it like this we add the same navigational pattern as all native apps. Download the source code below. 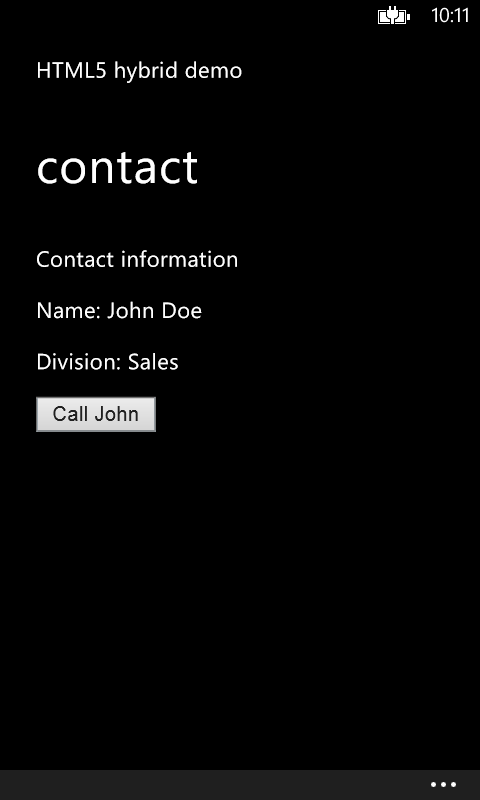 This entry was posted in C#, HTML5, Windows Phone, XAML on August 21, 2013 by Johan. 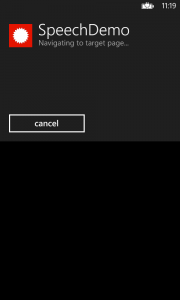 In Windows Phone there are great features to communicate with an app using voice. In previous post I have described how to command your app using your voice. 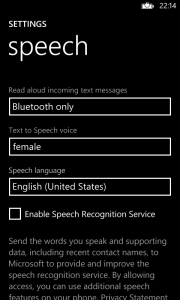 In this post I will cover on how the app can respond using text to speech. 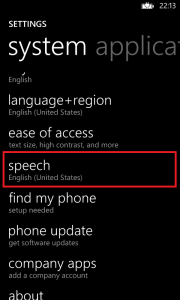 The feature text to speech can be used in various scenarios to give the user feedback and is definitely a great tool to optimize your apps accessibility. The entire source code can be downloaded at the end of the post. 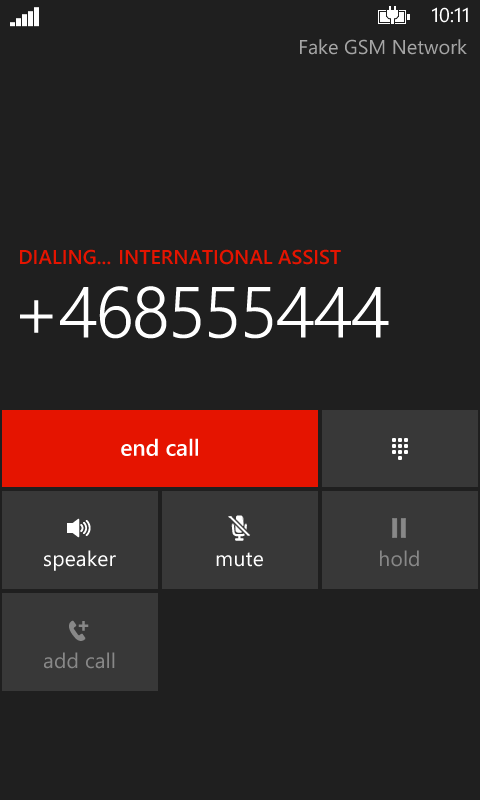 Windows Phone have support for 15 languages (sadly, not Swedish) and each language comes with two voices, one male and one female. 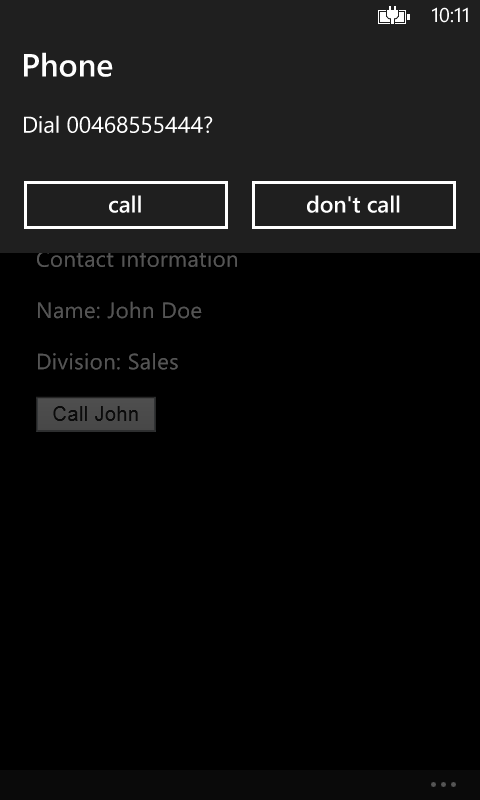 The phone has one voice set as default. 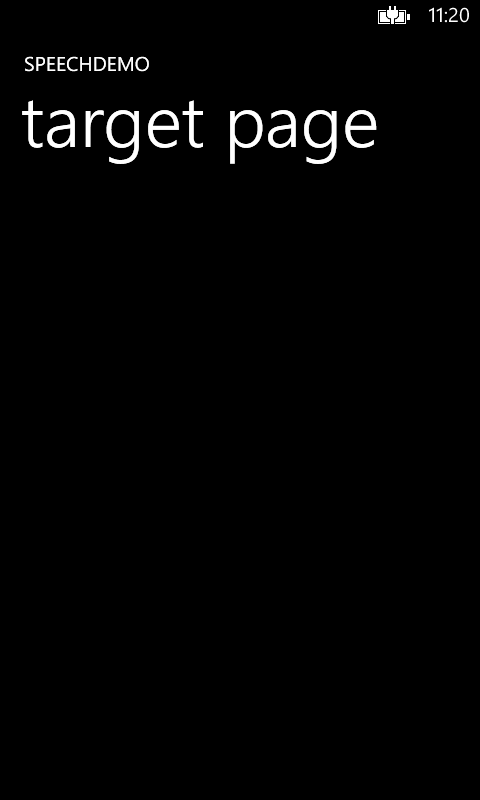 This can be viewed and changed in the phone settings. The default voice is the one to be used if not the app say otherwise. 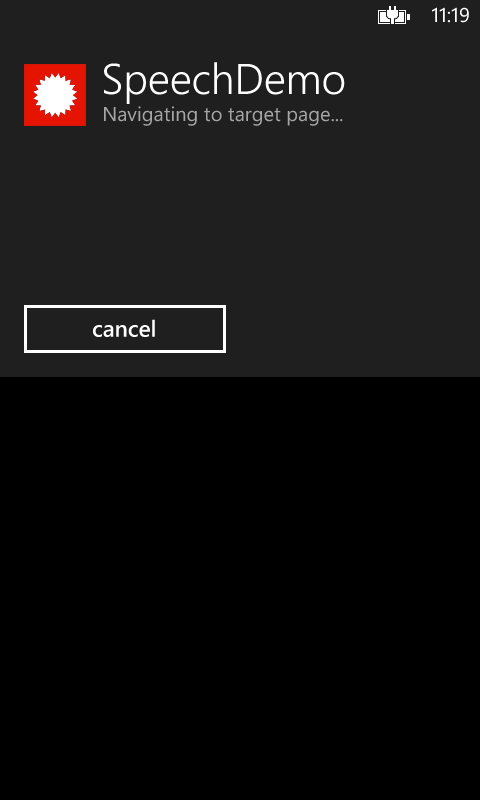 First of all we create a simple UI with three buttons supporting our three scenarios. Add event handlers to the buttons. 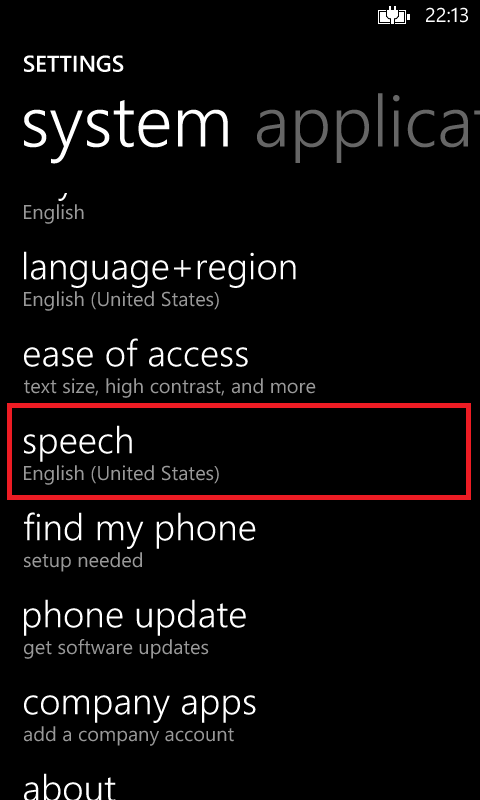 Now we need to add speech recognition capability to the app. If not, we will get a security error when we try to speak any text. Open the app manifest and add the capability as shown in the picture below. Now we will dig into the code and start with scenario number 1. 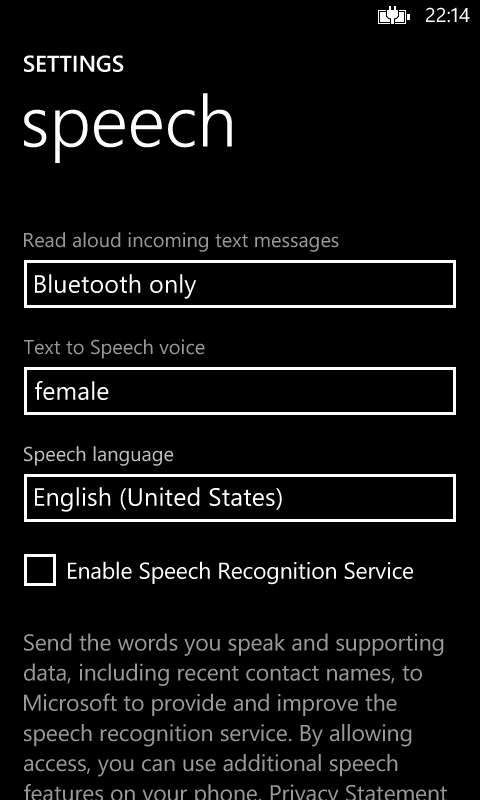 The crazy thing here is that only two lines of code are needed to speech text with the default voice. First of all we create a new method and in that we create a SpeechSynthesizer object that will be used to speak the text we will provide for it. 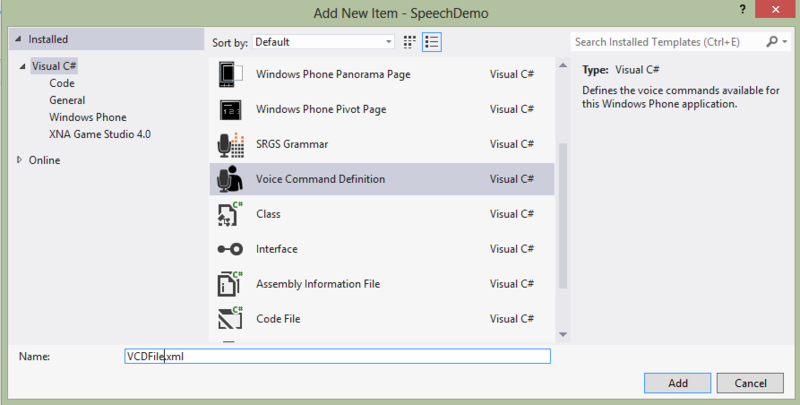 Then we will use the method SpeakTextAsync on the synthesizer-object and send in the text. Note that this method is async so we need to decorate our method with the async keyword. //await the synth while it speaks the text of your choice. This will use the default voice. For our final scenario we will create a method that will loop through all the installed voices and let them say “Hello World”. Just as in the previous example we will use the installed voices, but this time we will loop over them and let each and one of them speak the text. 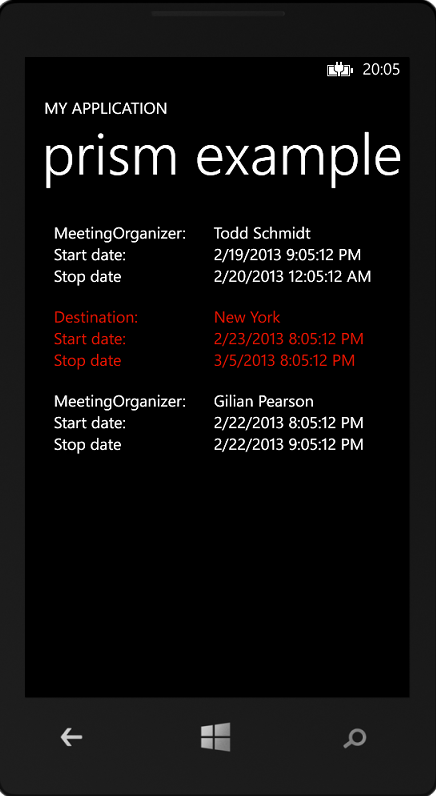 This entry was posted in C#, Windows Phone on April 9, 2013 by Johan.